Treat your cat to the playful name with the seriously great taste with Under the Sun Witty Kitty Grain Free Wingin' It Chicken & Turkey Recipe Canned Cat Food. Made with delicious chicken and turkey plus farm-grown cranberries and peas, this food also comes in a variety of other tasty choices with dynamic duos. And since it’s formulated for cool cats and smitten kittens of all ages, they’re great for multi-cat families too—in a convenient, pull-tab can! Mouthwatering recipe features chicken and turkey shreds in broth. Formulated for cool cats and smitten kittens of all ages. Potato and grain-free recipe includes vitamins and minerals. Comes in convenient, single-serving cans for less mess and leftovers. Made in the USA with uncompromising quality by the family-owned company. Feed according to the age, size, and activity of your cat. Feed at room temperature and refrigerate unused portion. Your cat should always have access to clean fresh water. Adult: Feed 2 - 3 cans per 6 - 8 lbs of body weight per day. Kitten: Feed up to twice the Adult amount to kittens. We recommend a 7 day transition period to smoothly make the switch as gentle as possible on your pet’s digestive system. You can increase the transition time if your cat is particularly sensitive to menu changes. When transitioning slowly is not possible, feed smaller portions more regularly. We suggest breaking up the daily intake to 3 to 4 feedings per day. Adding warm water to the food will also decrease the chance of your pet eating too quickly and not chewing thoroughly. Gulping a highly palatable product could cause vomiting. If at any time during the transition, your pet experiences gastro-intestinal upset, keep the ratio of new to old food the same for several days. This will allow time to adjust to the new ratio before you incorporate more of the new food. In the event you are not transitioning with your old food, withhold food for 1 day and then start re-introducing 3 to 4 feedings per day mixed with warm water. All other treats and supplements should be withheld until fully transitioned. You may notice a change in the appearance of your pet’s stool even after the transition period. This can often be a result of a change in the amount of fiber and protein in the new diet and is normal. CANIDAE Under The Sun is crafted with a variety of delicious, farm-fresh ingredients for a complete and wholesome meal for your cat. These recipes are grain-free and feature either a single animal protein like chicken, or multiple proteins, like salmon and chicken. Quality ingredients are combined to make mouthwatering, nutritious meals for your cat. All recipes are free of potato, corn, wheat, soy, and chicken by-product meal, and they're made with plenty of nutritious fruits and vegetables that will keep your pet healthy and satisfied. As an alternative to grains, CANIDAE uses garbanzo beans for slow-burning carbs that are rich in fiber and iron. These formulas also include flaxseed that's naturally rich in omega-3 fatty acids to enhance the coat's sheen, and pumpkins that are extremely beneficial for your cat's digestive health. It's a great feeling when you can trust what's inside your pet's food, knowing that you're feeding the best meals to your furry companion. CANIDAE Under The Sun is blended with farm-fresh, wholesome fruits and vegetables like carrots, peas, butternut squash, pumpkin and blueberries. These quality ingredients create a delicious dinnertime for your pet. CANIDAE Under The Sun uses a delicious variety of high-protein meat and fish sources that are sure to satisfy hungry cats. Let your kitty dine on salmon, chicken or turkey—no matter which recipe your cat prefers, you can always be certain that it will have quality proteins and tons of vegetables and fruits. Entice your kitty with a choice of different flavors and textures that your four-legged companion will love. 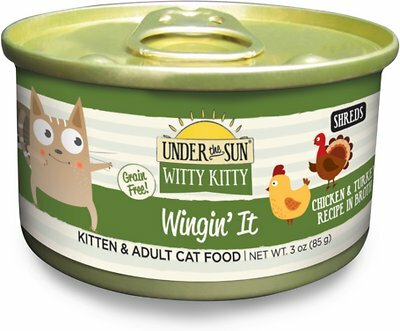 Full-flavored recipes are made as patés as well as flaked and shredded meat or fish dinners so all cats can have a delectable meal in the texture they desire. These 3-ounce, ready-to-serve cans make serving your cat breakfast, lunch and dinner easy and stress-free. Each wet food formula is great for finicky eaters and is full of delicious meat or fish, or a combination of flavors. Try the Hooked On You recipe with shredded cod and trout or the Duck & Cover paté with turkey and duck. These recipes provide multiple protein sources and will be sure to tempt your cat when dinnertime rolls around. My cat is an eating machine...he really loves this food. Very substantial portion and quality product. This entire line has always been well-received by cat & human. I can't complain cats can ! Good ingredients, rated very well but, my cats won't eat it !! Had to change brands. My boys that are 1 yrs old and 2 yrs old have ate nothing but Wellness (hard and wet food). But they changed the formula & my boys stopped eating it and started to have diareah. Switched to this brand (hard & wet food) because of USA made & the quality. My boys now are eating & having no stomach issues. Me & the boys are happy!! I have had 2 feral kittens that were 8 weeks old and are now one year old and they love it. Every time it is time to eat they do a kitty dance. Funny to watch. We selected this brand due to the lower calories for our slightly hefty Calico - she is liking this product and flavor. I’m surprised at the negative reviews. My senior cat likes all the Witty Kitty flavors she’s tried, but she inhales this one! took a chance but- My kitten ,1yr old and 2 older cats don't like this.4 out 4 say ,no.